Teamwork. You're gonna need it. 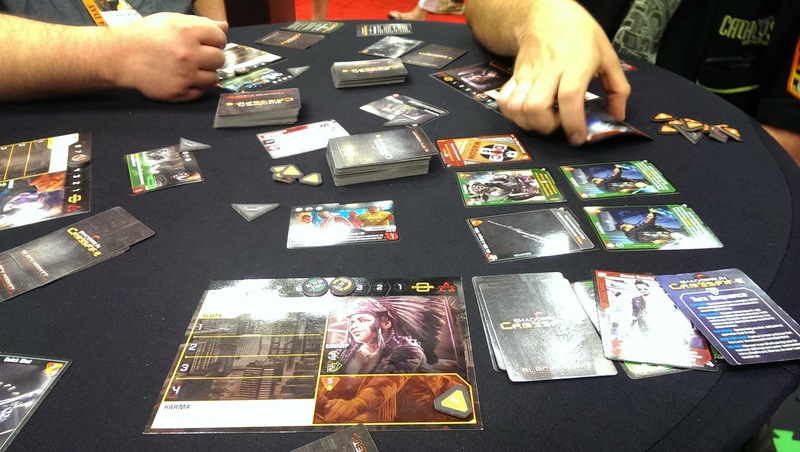 Crossfire is a deckbuilding, cooperative game set in the Shadowrun universe. I’ve been looking forward to it since I demo’d it last year, and it was finally available in limited quantities at this years show. I got a chance to demo it on the floor and a friend picked it up so we played a full round in the evening as well. The game is similar to the Pathfinder Adventure Card game – each player has a role with a somewhat unique set of cards. 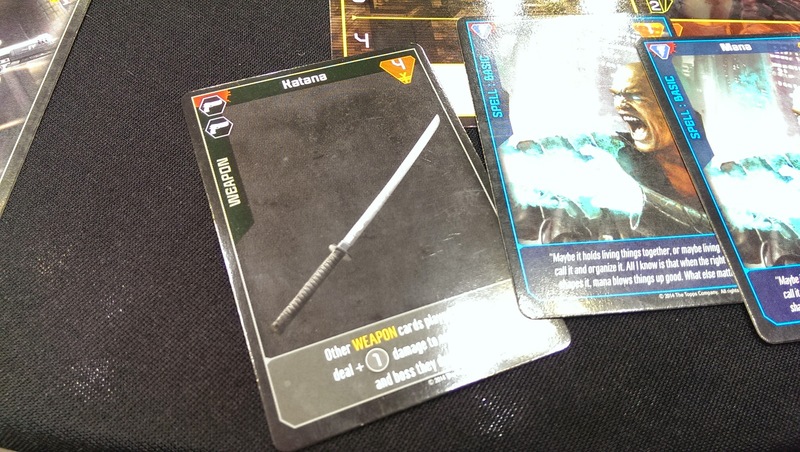 Over the course of the game, weapons and items get added to the deck to make it more powerful. In addition, there are long-term campaign benefits that increase a players abilities and power from game to game – I believe decks are supposed to carry over as well, although I’m not totally sure that’s true. One thing I like about Crossfire versus PACG is that your threats are out there the whole time and any player can target any obstacle, not just the one in front of them. This means that if an enemy is vulnerable to magic but you’re just carrying guns, you can get help from the mage while you take out other enemies. In PACG I often found you’d encounter a weapon you couldn’t use or an enemy or trap you couldn’t bypass and you just had to suffer through it. Weapons would be lost even if someone else really wanted them. In Shadowrun the opponents and equipment are separate so you can get what you need, not just what you happen to stumble on, in addition to targeting the opponents you’re most effective against. Teamwork. You’re gonna need it. Even so, this is Shadowrun – a futuristic cyberpunk world (much like the Android universe) where players take on the roles of agents for hire – agents hire to do difficult, dangerous jobs that no one else is willing to do. So it’s no walk in the park to win a mission – you have to face a lot of enemies and coordinate your turns in the most efficient way possible so you don’t end up bleeding on the floor. The demo was a single “scene” which isn’t difficult on its own, but when we tried the full first mission in the evening, we found it to be very difficult. In fact, I ended up bleeding on the floor in the last scene and my friends had to abort the mission. (The campaign rules reward you with “karma,” shadowruns version of experience points, if you successfully abort a mission over just failing it completely). I’m pretty interested in playing through a Shadowrun campaign. I like the more cooperative feel of the game, the streamlined combat, the teamwork, and the shadowrun theme. Good times. I’m glad you liked it! Several friends of mine work on it, and I’m excited to see it finally come out! One thing to note, you do reset to the starting deck for whatever role you choose every time you play. In that sense it’s more like Dominion or Ascension than PACG. You do get Karma (XP) which you can use to slowly level up your character over several sessions. Unless they’ve changed the table (entirely possible), low levels of karma (say, 2-3 games worth) let you tweak your starting money or health in small ways. Greater levels of karma stat doing crazy things, like you might expect from Shadowrun. Also, if you haven’t seen the rules since the demo at GenCon 2013, you should take a look – I heard that they were thinking of cutting Aborting a Mission from the game. Our evening game was with the retail box, and in that rulebook was where I learned about aborting the mission… so I guess they kept it in.